Please use the drop down box carefully to change from the size available. All cushions name size are on main photograph. Add some Art Deco glamour to your bedroom with the stunning Celeste in soft shell satin. Tiny pale grey sequins sit delicately across a fine tulle in an organic, feather-like cluster. Complement the bedlinen with the quilted satin throw offset with a generous panel of sparkling sequinned feathers. Enhance that Kylie sparkle with a selection of cushions in sumptuous satins and velvets. Measurements Duvet Cover, Housewife, Square Pillowcase & Cushions. Super King 260cm x 220cm. House Pillowcase 30cm x 75cm. Square Pillowcase 65cm x 65cn. Celeste Throw 130cm x 220cm. 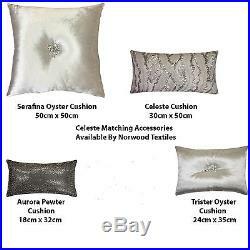 Serafina Oyster Cushion 50cm x 50cm See Main. Celeste Cushion 30cm x 50cm. Aurora Pewter Cushion 18cm x 32cm. Trister Oyster Cushion 24cm x 35cm. Duvet Cover & Pillowcase Face 100% Polyester. Duvet Cover & Pillowcase Reverse 100% Cotton. Duvet Cover & Pillowcase 200 Thread Count. Wash and cool tumble dry inside out cool iron on reverse. Bed Runner and filled cushion are dry clean only. This product is embellished with small parts these may prove to be choking hazard for small children. Over 25 years, family run business of offering top quality goods at affordable prices so customers could have beautifully furnished homes that they love and enjoy every day without breaking the bank. As a family business we are looking after people has always been a top priority. This means taking good care of both our customers and staff. We are constantly striving to offer our customers better quality products and services. Whether you are in store or browsing online we are always here to help you with all your home needs. We train our staff to a very high standard so that they can offer customers expert advice they can rely on. After all, the products we sell are the things that you live with every day, so it is important to make everyone happy. We like to go the extra mile and offer specialist services that will save you time and make life easier for you. Specialist Services for our very special customers. Opening Office Hours 9:30am to 5:30pm Monday to Friday. Here at Norwood Textiles, we take it upon ourselves to ensure that all of the goods and services that we provide of are the highest standard. Should this be the case you should endeavour to return the unused item to us, preferably with the original packaging, within thirty (30) days of receiving the product. We (Norwood Textiles) will authorise the return so that it can be accepted by our warehouse. Sadly, this process might take a few days after the return is accepted, but note that we will try our best to resolve the issue as soon as possible. If we issue a replacement, Norwood Textiles will deliver the new product at no extra cost. However, if the products are found to be faulty, exceptions can be made. We are also unable to accept any products which have been assembled. It is buyers responsibility to ensure the item is unused and in the original condition and packaging. If you would like to return your item for any other reason we will of course accept the return if informed with in 30 days. This listing is currently undergoing maintenance, we apologise for any inconvenience caused. The item "Full Set Kylie Minogue Bedding Designer Celeste Shell Accessories Included" is in sale since Tuesday, August 23, 2016. This item is in the category "Home, Furniture & DIY\Bedding\Bed Linens & Sets\Bedding Sets & Duvet Covers". The seller is "norwoodtextiles" and is located in Glasgow . This item can be shipped to United Kingdom.